Use these tips from punch guru and mixologist Julie Reiner to create your own signature party punch. 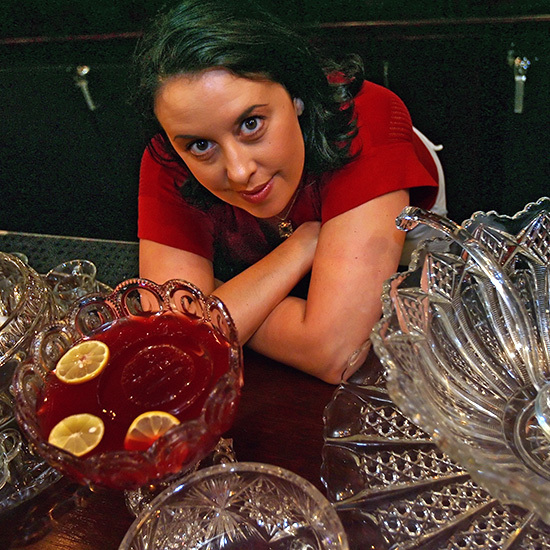 “Once, I made 60 gallons of punch for a single event!” says mixologist Julie Reiner. Reiner’s an all-star in the drinks world for the outstanding cocktails she’s created and the New York City bars (Flatiron Lounge and Clover Club) that she owns, but she’s also come to be known as a bit of a punch luminary. She was really the one to set off the trend of large-format cocktails in bars about five years ago. A massive bowl of booze is a frantic host’s fail-safe way to make sure that every guest has a drink in hand on arrival, without having to fuss with a cocktail shaker and jigger. And it’s fun to experiment with different punch ingredients and blends. Just make sure to follow Reiner's smart guidelines to avoid something that recalls jungle juice of days gone by. 1. If your punch will be enjoyed over a long period of time, make a large block of ice to keep it cold. Big ice will melt slowly and keep the punch chilled for quite some time. I generally use a 1-2 quart Tupperware container at my house. Be aware that it will take approximately 24 hours to fully freeze, so plan ahead. 2. Punch should be lighter than a regular cocktail because it is meant to be sipped continuously over a long period of time. Partygoers should be able to have several cups without getting too smashed. Look to tea and citrus to lengthen your punch. 3. If your punch contains sparkling wine or Champagne, make sure to add it at the last minute, just before serving. Bubbles are great but they don't last forever, so make sure to add it to the bowl as your guests arrive. 4. Don't use vodka as the base spirit for punches. Look to more flavorful spirits such as rum, whiskey, tequila, Cognac, calvados or pisco. 5. Consider using sherry, port, Madeira or wine in your punch. They all add great flavor and are low in alcohol. 6. If it will be a long evening, store some of the punch in a pitcher in the refrigerator so that you can add it to the bowl when the punch starts to become over-diluted. This is the time to add a new block of ice as well. And if you’re not feeling all that creative this time of year, whip up a batch of Reiner’s incredible, mulled cider-based Harvest Punch. Reiner serves this punch both hot and cold at Clover Club. In the bottom of a punch bowl, muddle the lemon peel in the cane syrup. Then, add the rest of the ingredients to the bowl and stir well. Gently place a large block of ice in the bowl and garnish with the apple wheels. Grate nutmeg over the top and serve. Makes about 10 servings. In a large saucepan, combine all the ingredients and stir. Simmer gently for 45 minutes. Let cool, then strain out the spices and discard. Refrigerate until ready to use.